I'm trying APM2 on HK 450pro heli. I just did the test and the result, pitch and roll are alright, it was stable. The problem is with my yaw/rudder. I need to push my rudder to most right to make sure heli stays and basically I had no yaw authority. I'm attaching the parameter file and the log file. Hopefully I can get a hint on which parameter I need to modify to get a better yaw authority. I think your RATE_YAW_P=0.6 is too high. I've noticed that when certain Yaw numbers are too high, it'll overpower the control. When it's too low, you have low/no control. When I used very well balanced blades, I could get my Rate Yaw up to 0.288. I'm now using a set of not-so-balanced blades, the tail was wagging and I have to lower it down to 0.206. My current Rate Yaw P=0.206, I=0.02, D=0.001, IMAX=50. Stab Yaw P=2.2, I=0, IMAX=6. It's a set of ever changing numbers. lol. The best result is when its almost 0.3, but its only good after few takeoff, the initial take off after powering the APM I got very little yaw authority. My guess is after take off for a while the rate I is building up and I got more authority. I also observed that when it hovering, the tail is twitching a bit. Is this the behavior you got? My tail is very stable right now. No more twitching like when I first started. I've noticed that more balance the heli, higher the Rate Yaw P you can use and having faster and more yaw authority. Today I mounted my FPV gear on and the heli was not quite balanced, the tail was wagging with P=0.206. I lowered it to P=0.2 and I=0.019 and the tail no longer wag. Oh, one more thing, I'm not sure if it's unique to APM2. At times, I have to hit the reset button or I would have low or no tail authority after I plug in the battery. Sometimes the tail would only go one way no matter I turn the tail left or right and it still only go the same way. A reset will fix it as well. Wesley: Yes, you need to hit the reset button every time after you power the board with the battery (a startup sequencing bug; we'll fix it in the next code rev). If you don't, it can either freeze the board, which you've already found, or cause the compass to give random readings due to skipping normal initialization. As for the tilt that you see in level, does this happen even if you've pushed the reset button? If so, I think it may be due to vibration. Traditional helis have much more vibration than multicopters. Are you using any vibration isolation? I made it a habit to reset the heli each time I get my hand on it. Just today, the tail all of a sudden gave out. I managed to land it and look at the tail. The tail servo moved only one way regardless which way my control went. Here went another reset. For the mysterious tilting, it persists. I can reset and re-plug in battery, the tilt is still there. It seems like the gyro was re-level in mid air. Well, it's more like I hit the auto-trim button in mid-air. Moreover, the tilting get progressively worst, just like what Yovio described. It started drafting one way. You can keep flying and flying and you'll need more and more counting stick to make it neutral. If I don't land it and reset it, I would eventually need to put the stick all the way to the side to counter it. Regarding vibration isolation, I believe mine is done really well. I used kyosho vibration absorption sheet that I also used for the Skookum SK720. The Sk720 also have 3 gyros and 3 accelerometer to acheive self leveling. Any big vibration would disable the self leveling feature. That's why before I mount the APM2 on this heli, I mounted a SK720 on it to make sure the heli has very low vibes to begin with. What version of the code are you using? 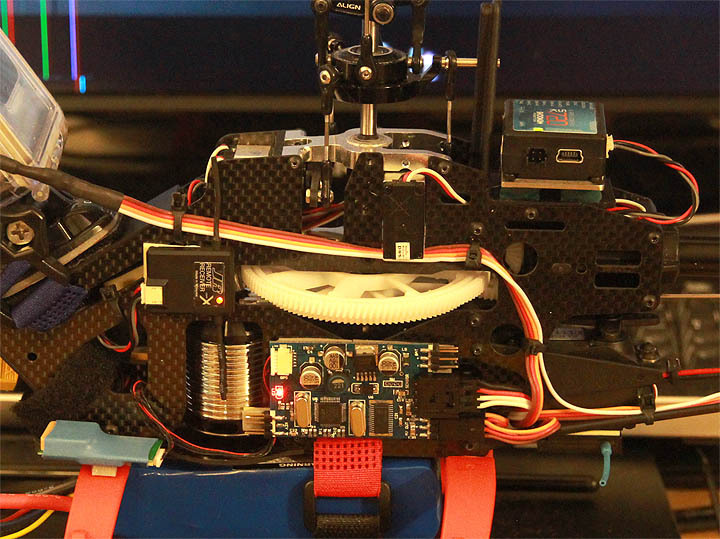 Here is a picture on how I mounted my SK720 for another 450 with all the FPV gear on. The SK720 also have vibes log showing the vibes for all 3 axis and the frequency of the vibes. It helps find out exactly where the vibes come from, and in turns, I can fix it. Thx, I will try to reset the board after plug in battery. I just reloaded the latest firmware and it warned me about the EPROM change. I think it was 2 days ago? It has to be the latest. Let me hook it up and find out. Yes, your theory on the I term is definitely possible. One thing that can help is the ColYaw term, which eliminates the need for an I term to build up. Unfortunately it's missing from the parameters list right now and I don't know why... Hopefully we get that fixed soon. Yes, that's the latest. I've never flown a helicopter, so I don't have any more advice for you. Randy MacKay is the heli god, so maybe he can help.